US Attorney General Eric Holder said that the DJ will use “all the power” it has to implement reforms at the Ferguson Police Department, even if that involves dismantling the entire department, Reuters reported. 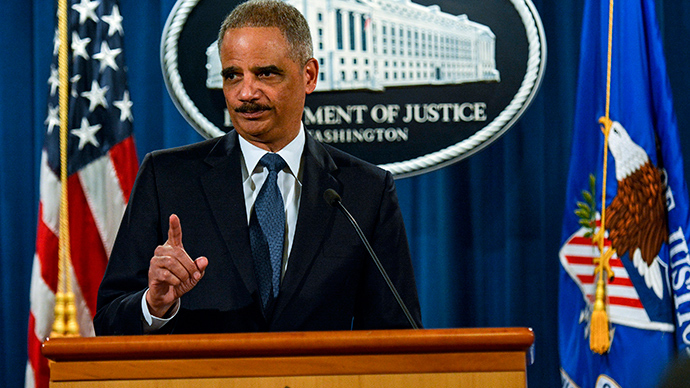 Holder initially stated that the Justice Department (DOJ) was determined to "ensurethe situtation changes" in Ferguson. "That means everything from working with them to coming up with an entirely new structure," he added, according to a transcript released by Buzzfeed's Jon Passantino. When he was asked if taking apart the force entirely was on the table, he replied,"If that's what's necessary, we're prepared to do that." The attorney general's comment comes the same week that the Justice Department issued a scathing report detailing systematic racial discrimination and a “highly toxic environment” at the Ferguson Police Department. The report found that police officers used excessive force primarily against African Americans and that they often detained and arrested individuals without probable cause. Regarding the report's findings, Holder said he was "shocked" as investigators uncovered just how deep the police department's unlawful behavior went. "The notion that you would use a law enforcement agency or law enforcement generally to generate revenue, and then the callous way in which that was done and the impact that it had on the lives of ordinary citizens of that municipality, was just appalling," he said. In the past, the Justice Department has helped implement reforms at police department's in Albuquerque, New Mexico and Cleveland, Ohio. Federal investigations into both police forces found patterns of excessive force and and systematic failures. READ MORE: Racist jokes prompt dismissal, 2 probes in Ferguson Police Dept. Negotiations between the federal government and Ferguson officials will begin in the next couple of weeks as the two sides seek a mutual agreement on what reforms to implement. However, if the negotiations falter, the Justice Department has the power to sue and make reforms mandatory. Referring to other police departments around the US, Holder said he hopes they are paying attention to the government's strong feelings about ensuring "that we use all the tools that we can to make sure that what happened in Ferguson is uncovered and simply does not happen in any other part of the country." "I also want to make people understand, there are 18,000 police departments in this country, and I think that what we saw in Ferguson was an anomaly," he said. Additionally, Holder said the government will create guidelines asking municipalities to stop using debtors prisons, which house those who owe cities money but can't pay the fines. However, he said the Justice Department cannot mandate that local governments follow through on its request. Meanwhile, two Ferguson police officers – Rick Henke and William Mudd – resigned after the DOJ uncovered multiple racist emails drafted at the department, CNN reported. Another individual, court clerk Mary Ann Twitty, was also fired.